My husband and I have been together for exactly 5 years and last night he told me something I never thought I would hear come out of his mouth. My omnivore husband has always been tolerant of my vegetarian ways, but given the choice, he’d love to eat steak, lamb, bacon, chicken, duck, and pretty much any kind of meat on a regular basis. Which makes his tolerance of my diet one of the many reasons why I love him. Occasionally I will make a vegetarian dish that he really enjoys and even requests to have again, but I never ever thought I’d hear him ask for more tofu. I mean, I don’t even like tofu. But in the husband’s efforts to be healthy, he has requested that I consider preparing dishes with a little more protein. So he posted this link of high protein vegetarian dishes on my facebook. (Ironically, I already make one of them on a fairly regular basis: Vegetarian Split Pea Soup. With such a short ingredient list, I can’t help but turn to this delicious soup regularly.) I decided to take his not-so-subtle hint to heart and try out one of the recipes from the list. First up: Peanutty Qunioa Bowls with Baked Tofu. This recipe stole my heart by combining two flavors I’ve been in love with lately: peanut butter and ginger. I hadn’t really combined them before, but I had to try. And since my dishes lately have been trending slightly Indian (like this and this) I figured it was about time to move the flavor profile a little further east with the likes of tamari and lime juice. Obviously, we were not disappointed! I doubled the recipe to use all of the baked tofu and make intentional leftovers. If you’re a pretty organized person (and/or pinched for time during the week) consider making the baked tofu recipe ahead of time or purchasing pre-baked tofu from the store. The rest of the recipe comes together pretty quickly. 2. 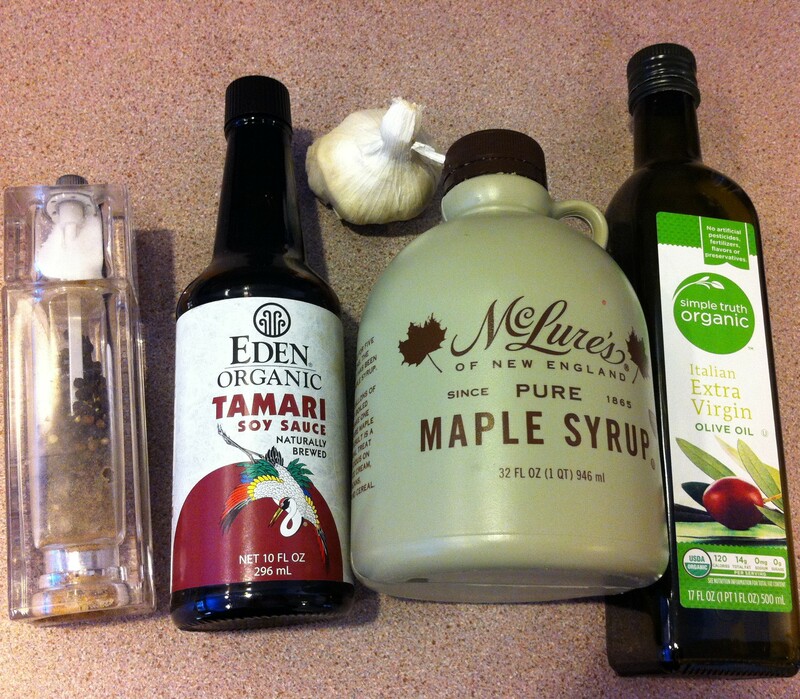 While the tofu is being pressed, whisk together the marinade ingredients. Dump the marinade in a baking dish that will just fit all of the slices of tofu. Place the tofu in the marinade. Let each side soak up the marinade for 15 minutes (30 minutes total). When you flip the tofu, preheat the oven to 400 degrees. 1. Prepare the baked tofu. 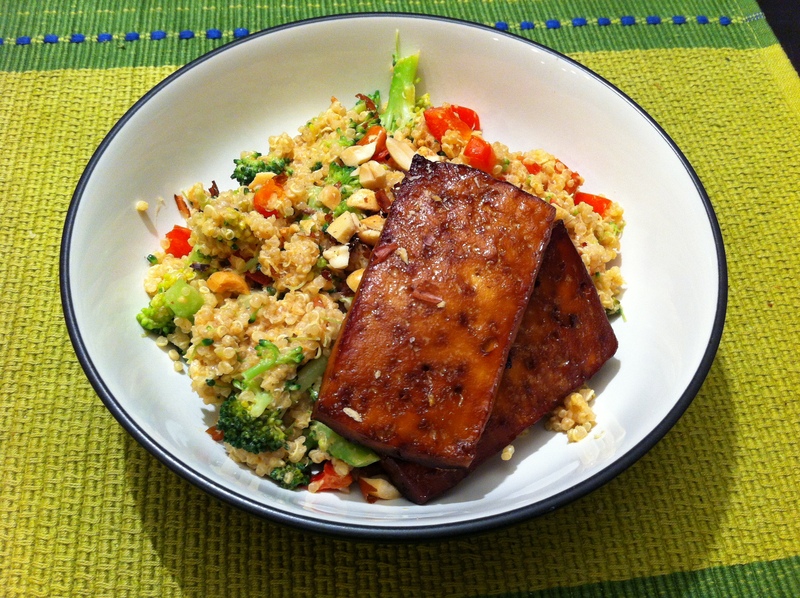 While tofu is marinating and baking, you should be able to throw the rest together. 2. Wash and chop the red pepper and the broccoli. Cook the quinoa according to package directions (2 cups water, bring to boil, then simmer for 15 minutes). While the quinoa cooks, heat the olive oil in a large skillet over medium heat and cook the red pepper for about 3 minutes, until soft. 3. Dump the red pepper into a large bowl. Add the broccoli and about 3-4 tablespoons of water back to the skillet. Cover with a lid and let the broccoli steam for about 2 minutes. Add the broccoli to the bowl with the red pepper. 4. Mince the ginger (I used a mini food processor). 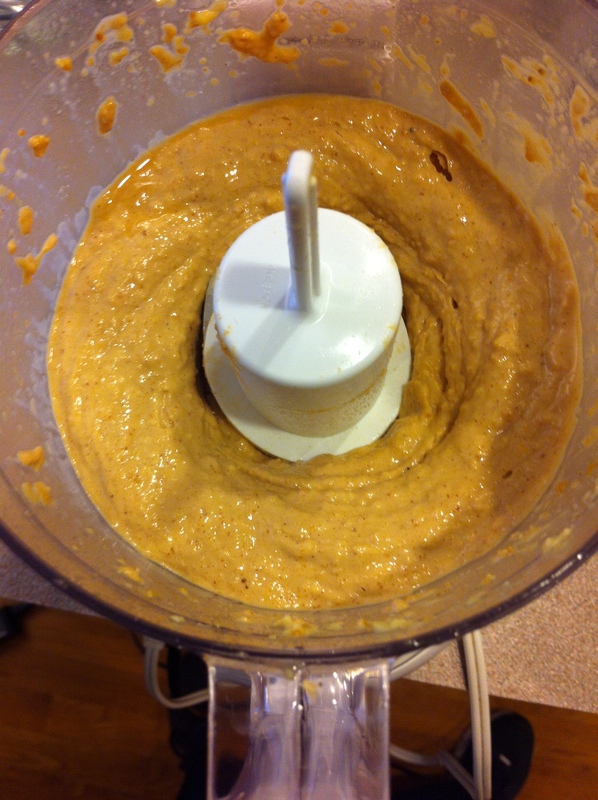 Whisk or process together the ginger, peanut butter, lime juice, water, tamari, and sugar. 5. Add the cooked quinoa and peanut butter sauce to the red pepper and broccoli and combine together. Season with salt and pepper. 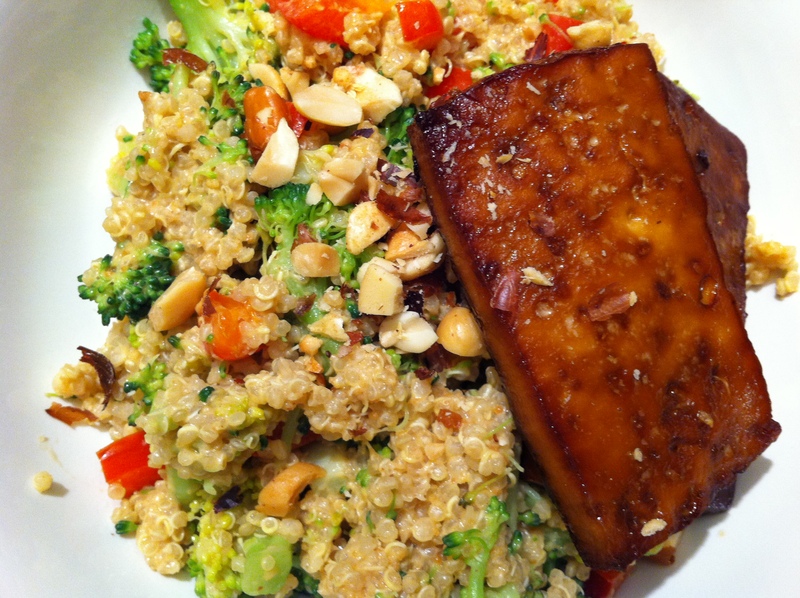 Divide the quinoa mixture among 4 bowls and add 2 slices of tofu and a tablespoon of chopped peanuts to each bowl.